i-MBA > Meet us at the Access MBA event on November 16th! Meet us at the Access MBA event on November 16th! The MBA International program will participate at the Access MBA event that will take place in Athens on November 16th, 2015. The Access MBA Tour connects qualified individuals with top international business schools. Our program’s representatives will be there to answer all the questions you may have about the main components of the program, the curriculum, the career prospects, the financial aid and the application process. 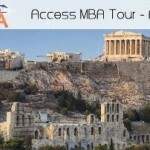 This year the event will be held in the Hilton Athens Hotel (46 Vassilissis Sofias Av., 11528 Athens), 4:30 p.m. – 10:00 p.m.
To participate, please register on www.accessmba.com.